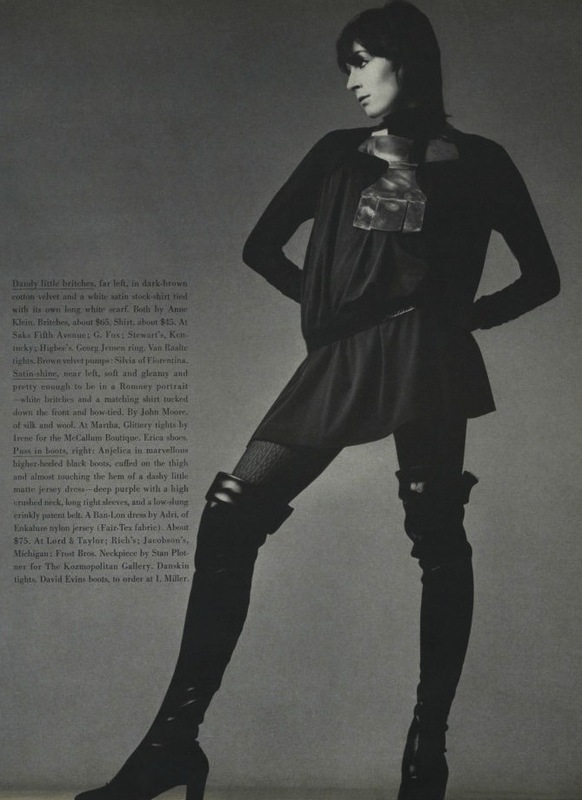 When I was wading through back issues of Vogue researching this project, I kept coming across the name David Evins associated with some truly spectacular pairs of late sixties thigh-length boots. And other boots, for that matter. 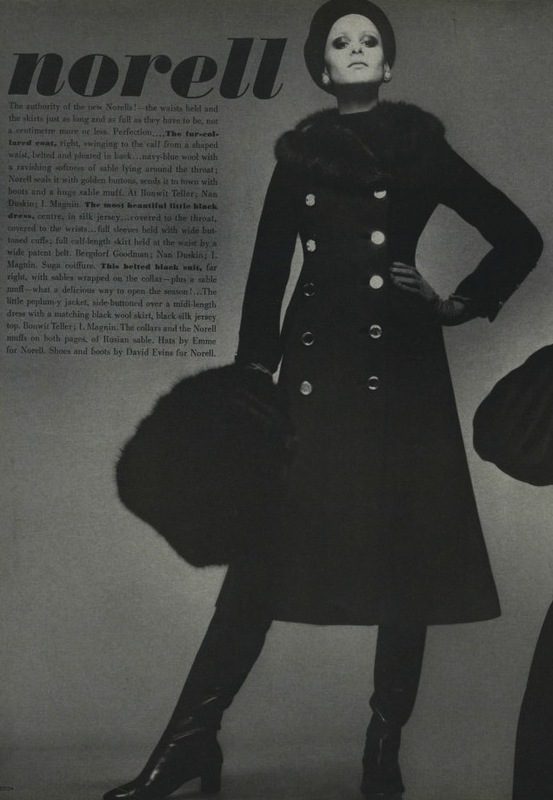 Other designers of the period, like Roger Vivier or Beth Levine, were already familiar to me. But who was David Evins? Evins was born in London in 1909. In 1922, his parents emigrated to the United States from England. As a young man, he studied illustration at Brooklyn’s Pratt Institute and went on to work as an artist at Vogue. While there, he made the fateful decision to alter the style of some shoes he was drawing for effect. It got him fired; as a parting shot, his editor suggested if he liked messing around with shoe design, maybe he should do that for a living instead. Evins took him at his word. After working as a pattern maker and designing for a number of manufacturers, he opened a factory in New York City in 1947 with his brother. In 1948 he won the Coty Award for his creation of the shell pump, a shoe with a low-cut top that showed more of a woman’s foot. 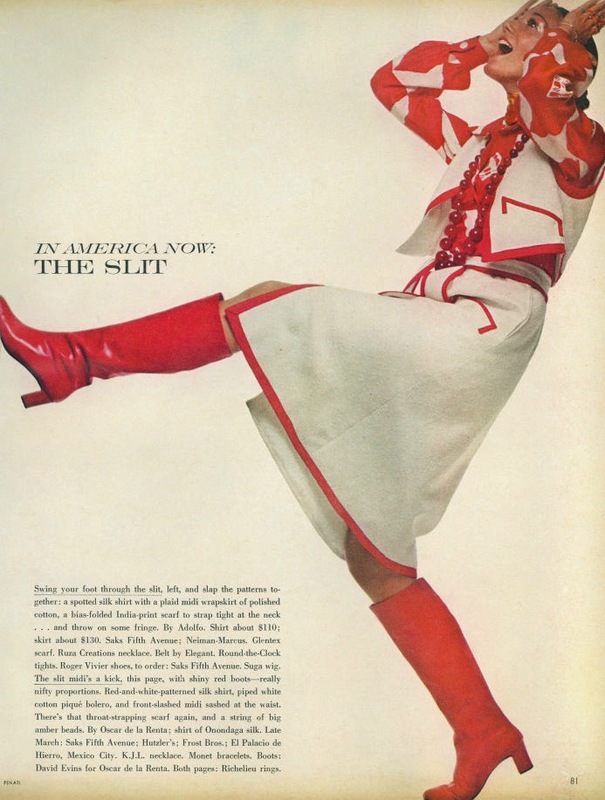 His design ethos was aimed at making shoes for women that were lighter and more comfortable. David Evins shoes did not come cheap. The handmade shoe called “6 ounces” sold for up to $175 at a time when quality women’s shoes cost about $45 a pair. But he attracted a very exalted clientele. He designed the “chunky pump” worn by Judy Garland, Marilyn Monroe’s “subway sandals” and the shoes worn by Ava Gardner in the film “The Barefoot Contessa.” He made shoes for every First Lady from Mamie Eisenhower to Nancy Reagan. He prided himself in the simplicity of his designs – “it’s not what you put on but what you take off,” he said, in a 1987 interview. “Yeah, but what about the boots?” I hear you ask. Truthfully David Evins was better known for his shoes – not for nothing was he nicknamed “the King of Pumps.” To get a sense of his boots, you need to trawl through the pages of magazines like Vogue, where his footwear for the shoe salon I. Miller features heavily in the reports on the New York collections, especially over the years 1967-1971. The first impression is that Evins’ reputation for clarity of design was well deserved. His boots are clean, simple, and devoid of excess ornamentation. They accentuate the lines of the clothing that they accessorize. They are both striking, and elegant. 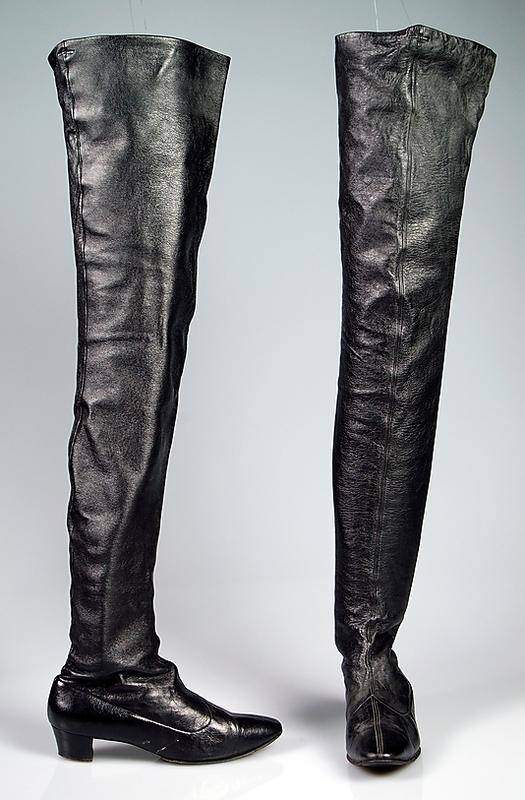 This is particularly true for the ultra-tall, thigh-length boots that formed the core of his work during this period. A couple of examples from the Brooklyn Museum Costume Collection at the Met are featured here. If you look at the brown vinyl pair above, you’ll see a couple of small loops at the top of the shaft. 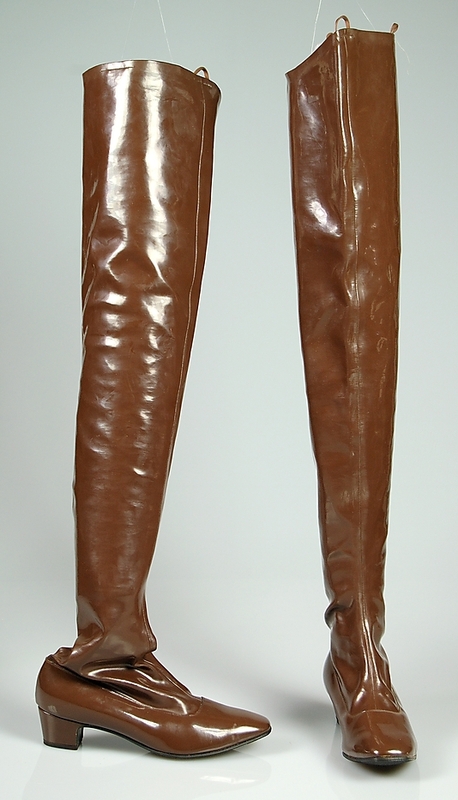 These were designed to connect to a suspender belt, the only way these boots could be held up. They were a demanding style to wear. 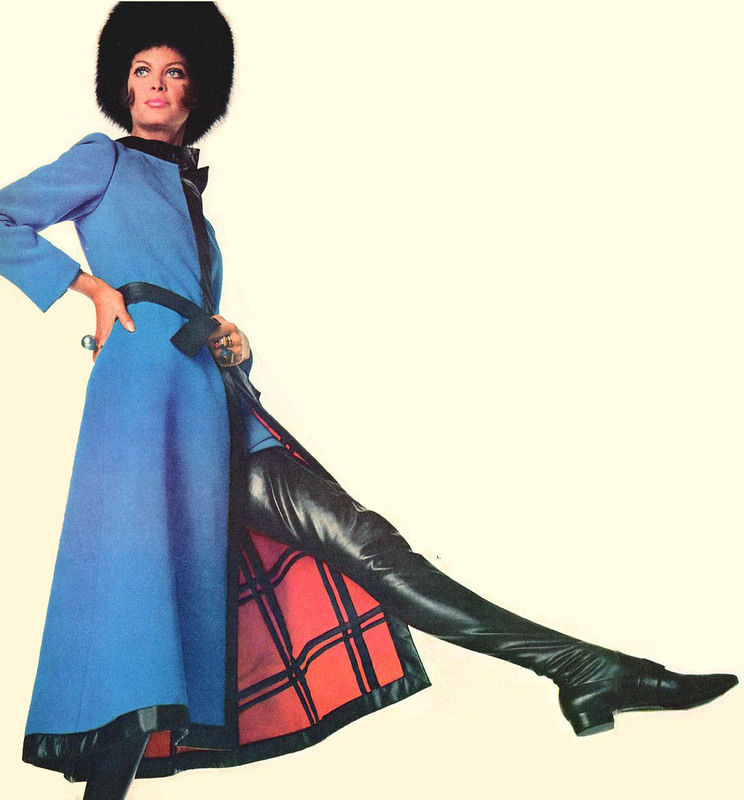 And in truth, Evins’ thighboots could probably only be carried off by one in a hundred women, those blessed with the mile-long legs of a fashion model and the bank balance of a millionaire’s wife. 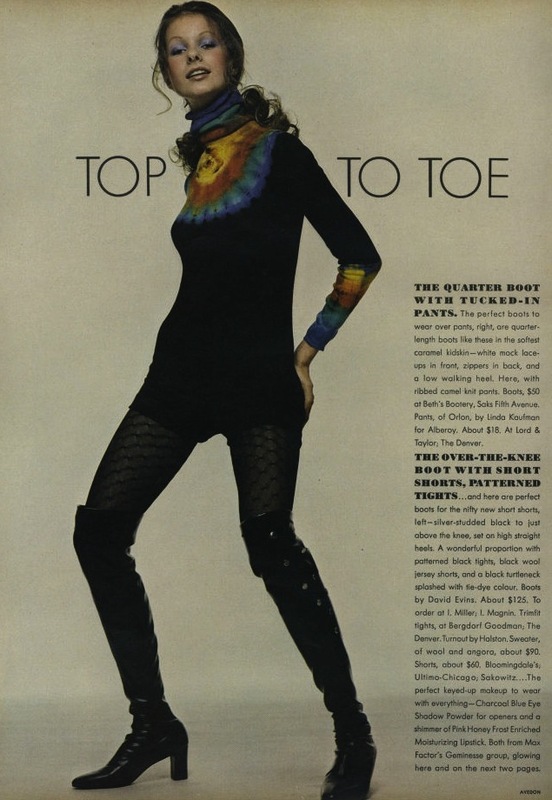 But Evins also designed shoes and boots for “ordinary” people as well. His knee-length boots were both stylish and eminently practical. 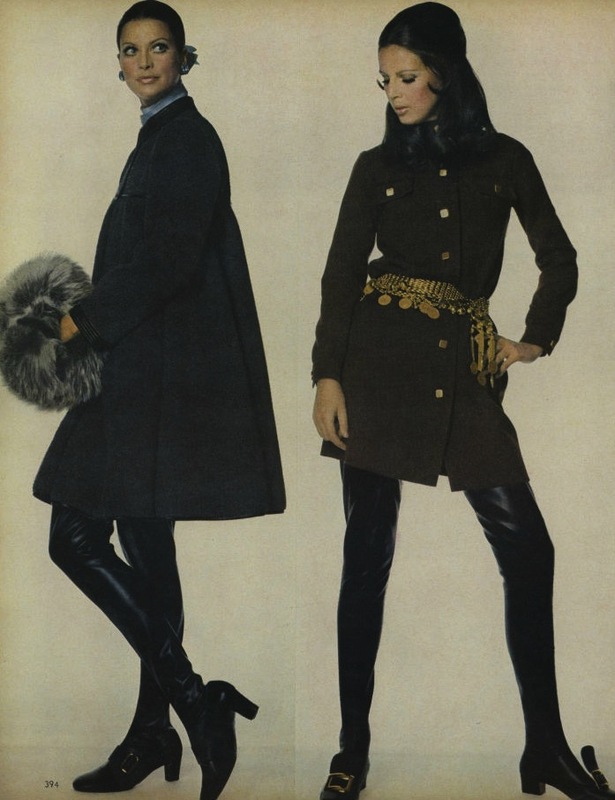 While they fit into the general category of late 60s knee-boots that we discussed in an earlier post, Evins’ knee boots foreshadowed by five or so years the styles that were to emerge in the mid-70s – the so-called “Cossack boots.” Rather than tightly hugging the calf as most contemporary boots did, Evins’ boots had a relatively loose-fitting shaft that crumpled into a extravagant stack of compression folds around the ankle. My sense from working my way through back issues of Vogue is that as the seventies progressed, David Evins designs appeared less frequently. But he went on producing outstanding shoes that were a model of simplicity and taste. He died in 1991, at the age of 85. Obituary: David E. Evins, 85, A Designer of Shoes For Ex-First Ladies. New York Times, December 29, 1991. 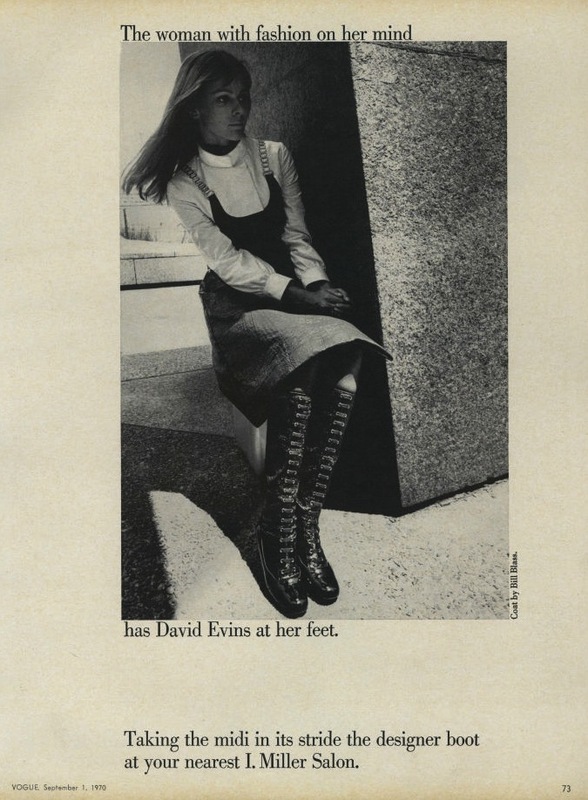 The Legacy of Shoe Designer David Evins. Today @ Colorado State University, Oct 15, 2009. Featured Monthly Designer – David Evins. Shoeworld.